The new President of JD.com Fashion and Lifestyle, Shengli Hu（京东集团高级副总裁、京东商城时尚生活事业群总裁胡胜利）, is pushing JD’s fashion business to transform, using both internal and external resources. Meanwhile, he is targeting the future of fashion and technology, working to open up ways for JD fashion to benefit from technology. In the recent 2018 JD Fashion Partners’ Conference, JD’s Shengli Hu explained the strategy for the company. Despite the fact that that JD Fashion and Lifestyle is just a sub-business at JD, is important to point out, is the first time that five vice presidents of JD attended the conference and shared their opinions. As China’ s largest ecommerce platform by revenue, JD.com offers a world-class set of online retail services to its legion of users, who now number close to 200 million in total. JD.com listed on the NASDAQ in May 2014 in the exchange’s biggest floatation of that year. In 2015 it recorded a GMV of USD 71.4 billion (RMB 462.7 billion) and net revenues of USD 28.0 billion (RMB 181.3 billion), the latter representing an increase of 58% from the year before. As a technology-driven company, JD.com has focused considerable effort in developing a robust and scalable platform which not only supports the company’ s rapid growth but also allows it to provide cutting-edge technology and services to its partners and customers. for oversea market, JD.com operates a global online shopping site:Joybuy.com. In fact, after taking on the role, together with his team, Shengli Hu has already negotiated with more than 60 brands and has gone on to brand showrooms in order to explore and learn about the industry. ‘To be honest, I’m not a rookie in the fashion industry anymore. I’m gradually turning into a veteran, as I’m making so many friends and partners in fashion’, Shengli Hu said. Shengli Hu is a veteran who helped JD to take most of China’s computer, communications and consumer appliances (3C) market share. He is introducing to JD Fashion, learning efficiency and readiness for transformation, which are essential to the Internet era. After this conference, he has received a great deal of positive feedback from brands. Based on his own experience, Shengli Hu shared with us his understanding of fashion: ‘in the area of 3C, mobile phones are the closest to the consumers, compared with computer and consumer appliances. Fashion is close to the consumers in a different way. It’s what people wear every day. As technology is developing so fast, I can see a future in which fashion and technology will combine perfectly in no more than eight years’. Fashion is an ever-changing, everlasting business that is the closest to consumers. In recent years, the fashion business has experienced a massive transformation because of the impact of the Internet. As a result, brands have had to constantly update their positioning, strategy, operations and designs in order to catch up. In this JD partner conference, the company has officially announced the establishment of a fashion research institute and a fashion technology association. This means that JD has made fashion technology part of JD Group’s strategy, which is also a first for China’s ecommerce platforms. The fashion research institute is planning to benefit fashion brands through AI, big data and ARVR research, as well as by developing a smarter supply chain. From Shengli Hu’s WeChat Moment, we can see that before he moved on to JD Fashion and Lifestyle, the last technology event he attended was CES 2018, and the last platform he built was JD Home. As a retail platform in a digital era, JD has always endeavoured to enhance fashion with the use of technology. From helping brands to overcome the challenges of logistics and stock, and collaborating with Tencent to establishing the fashion technology research institute, these actions are all based on JD’s concept of ‘retail with no boundaries’. As a result, hundreds of fashion retail services harnessing the power of technology will be launched. From identifying popular products to creating popular products, can JD excite brands and influence consumers? Despite the fact that JD has established a collaboration with Tencent and Vipshop, Shengli Hu was honest: ‘To build a good fashion business, JD has to still rely on ourselves and on the JD group’. As a 3C retail platform transforming into fashion retailing, the most challenging thing is the way of thinking. Shengli Hu explained the difference between 3C retailing and fashion retailing: ‘These are two different models. With 3C, we were mainly selling our own stock, but with fashion, our platform has to be ‘Platform Open Plan’, which means making it a platform for brands to sell in. We have realised the importance of changing the model in the past, but now we have a stronger perception regarding this and will take the appropriate action’. Before the opening of this partnership conference, brands including Oris, Casio, Citizen, Aokang and Samsonite took part in its warm-up events. In 2015, JD launched a designer incubating programme. Since then, it has taken Chinese designer brands to Milan and London fashion weeks. Shengli Hu told us that JD attaches great importance to maintaining the identities and image of luxury brands. For example, there is a warehouse dedicated to luxury products. JD TOPLIFE also offers luxury brands an exclusive retail environment. In terms of social responsibility, Zetian Zhang, the honorary director of JD’s Public Welfare Foundation, has signed a contract for a partnership with the United Nations Development Programme (UNDP) for the construction of a platform featuring the sustainability and recycling of materials. JD also works together with a number of NGOs. This will be the ultimate topic in the area of fashion technology in future, despite the fact that consumers might not yet have realised it. 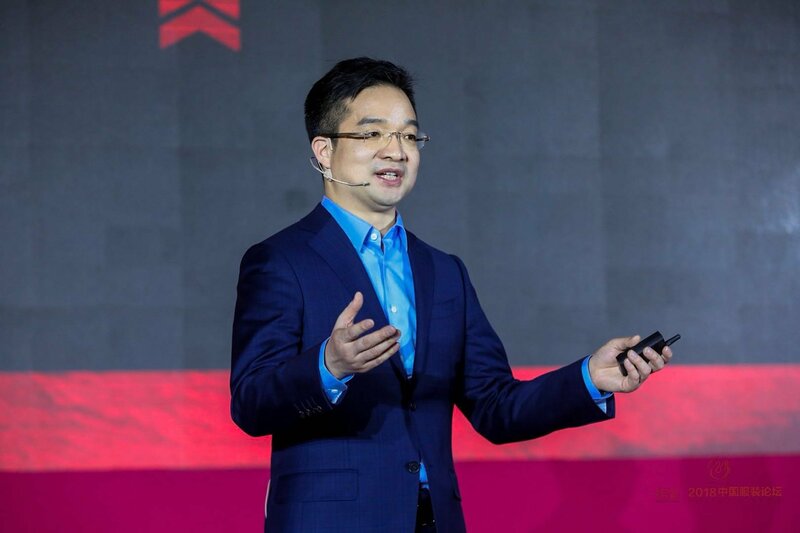 Shengli Hu mentioned that before he joined JD five years ago, Qiangdong Liu, the founder of JD, said in a CCTV interview that there would be three stages for shopping: ‘you get what you see, you get what you need, you get what you want’. Currently, the retail industry has already gone past the first two stages. In today’s relatively fragmented lifestyle, there are online platforms everywhere to satisfy people’s urge to buy. Shengli Hu said: ‘Judging from the global trend, all businesses, including both fashion and technology businesses, have to get closer to the consumers. In the past, we stood together with the customers in terms our value, but in future, it will be more than about just value – the whole supply chain will about the customers’. Based on this belief, as well as JD’s around 300 million active customers, he believes that ‘giving the customers whatever they want will be JD’s ultimate goal’. ‘Since I’m now working in the fashion department, I’m not just going to create a successful fashion business for JD. The biggest value I can provide is to make JD’s smart supply chain benefit the whole industry’.